With 2.9, we gave the user interface a little make-over. It's a nicer experience that improves on ease-of-use, speed, and consistency so you can get more done, faster. 1. Added ~30 "Quick List" starters for Investors and Realtors in the "Make a List" criteria. No more having to remember basic list-type criteria. We've done that for you! 2. The menu navigation is now the same as the mobile apps. Moving forward, we aim to keep the web and mobile app user interfaces as similar as possible. 3. The new menu navigation means less clutter, more workspace, and a faster load time. The "My Lists" Dashboard now lets you see all your lists. 4. The web and mobile apps now remember where you left off...and return you to the same module when you log back in. 5. Quick Search is persistently one-click away - in the upper right of the app, and in the menu. Inspired by our Apple Watch app, we also added an "Explore my Location" feature to Quick Search. 6. Added lightning icon to the list card to indicate dynamic lists. 7. Saved searches are now accessed through the main menu. 8. 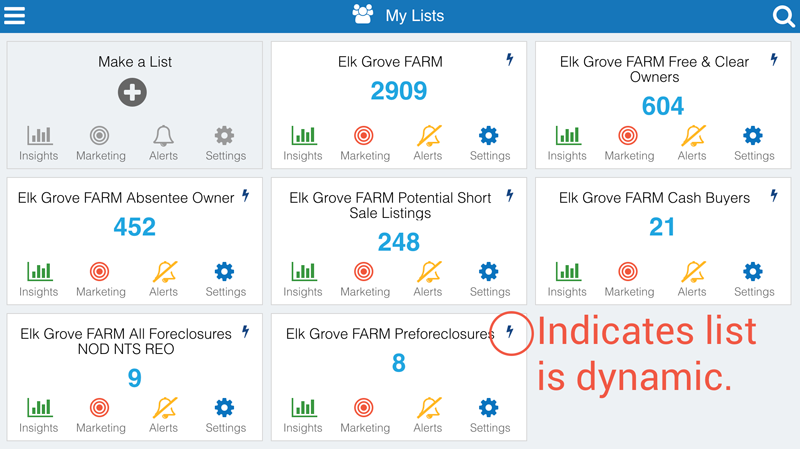 All property insights are now accessed from the main menu under Saved Properties. 9. Settings is now a full page view. Clicking on Update for one section will close the settings window. 10. Improved handling of special characters, including emoji, throughout the app. Most notable places are List names, Notes, Status names, e-mail messages Reports and attachment file names. 11. Resolved issues with alerts that had a blank name. 12. Now can accept credit card expiration dates for dates after 2026. 13. Resolved issues with leading and trailing spaces. Users can still enter spaces which do not cause issues. 14. Fixed issue where check box criteria selections in Make a List would reset after returning to that criteria. 15. Fixed issue where saving a dynamic list would not check the names of static lists for duplicated names. Deleting a picture from Property Details resets the screen position and does not remove the picture from the current view. The picture is deleted and will not appear next time you load the property. Opening Settings > List View Columns using the Edge browser can cause performance issues. If you upload a file attachment with an emoji in the name, the name is not shown. Sometimes the app gets in a state where the close X on pop-up dialogs is not properly located. The "Busy Indicator" is no longer shown on Settings > Billing page. Customers with a long history of transactions will likely experience very slow load times on this page approaching a full minute.